The ultimate trip for the profound and committed Steelheader who likes a bit of sweat with their Steelhead. During 5 days you will daily discover premium fly-fishing Steelhead water with numerous holding pools in the most stunning scenery with an abundance of wildlife ever present. If the idea of going on a wilderness adventure to target large, wild Steelhead in remote areas on lightly fished streams gets your blood racing, then our new remote coastal Steelhead package is what you’re looking for. 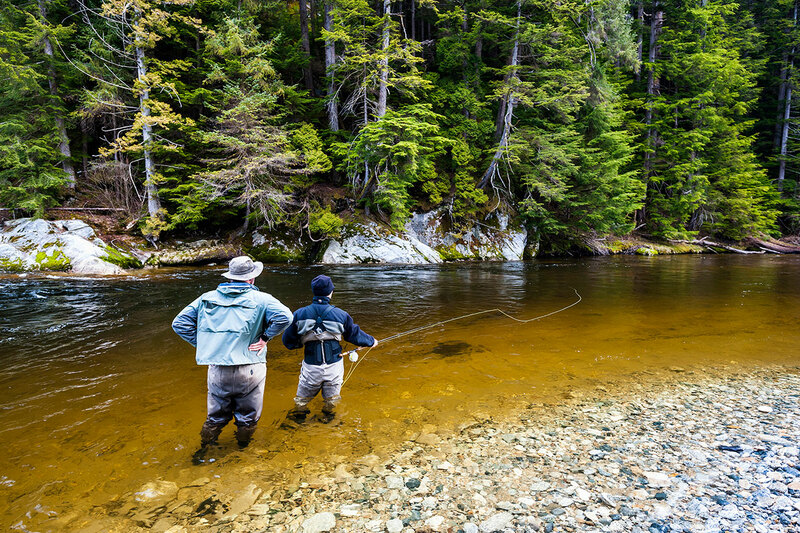 The remote coastal wilderness Steelhead streams of British Columbia hold exceptional spring Steelhead opportunities located in the stunning fjords of the Great Bear Rainforest. There are numerous streams – accessed by walk in, ocean boat, fixed wing air craft and helicopter – that vary from medium sized rivers, best suited for swinging flies with a Spey rod to small, intimate streams where you can sight fish for 5 to 20 pound Steelhead and fish for them with a light switch or single handed rod. For the 2017 season, Salmon Junkies, together with our long term partner in British Columbia – Nicholas Dean Outdoors, will launch an exploratory coastal program over a three week period in late April and early May. Guests will stay at Pioneer Fishing Lodge as a home base for arrival days and departure nights, and then stay in remote camps or bed and breakfasts as required during the week, depending on weather, water conditions and which rivers are fishing best. Due to the remote, physically demanding nature of the fishing program, guests must be reasonably fit and capable of hiking through dense woods without any trails. Typical distances travelled daily are between 3 and 6 km. Getting to the various coastal rivers is half the experience in its own right! Depending on the target rivers fished, we will use a 21 ft Boston Whaler, 20 ft Harbercraft jet boat, or a larger crew boat operated by local First Nations captains to navigate the stunning marine environment. For the ultimate experience and flexibility to move around between watersheds, helicopters may also be employed, as well as fixed wing aircraft (see note on inclusions/exclusions). Boating times on the Ocean will vary depending on the rivers fished, from half an hour to over 3 hours. While on your trip, there will be little communication with the outside world – after all, it is the remote BC coast you’ll be prospecting! Cell service and wi-fi communication will not be available on your trip, with the exception of your days/nights spent at Pioneer Fishing Lodge. However, your guide will have on hand at all times a GPS device capable of communicating with the office should you need to send a message out and, in the unlikely event, if an emergency situation does arise, it does have SOS capabilities. Given the remote nature of the trip, there is the possibility of encountering bears, wolves, foxes and other animals of the furry kind. Your guide will have bear spray and bear bangers on hand at all times and will also instruct you on how to use these. The chances of encountering these kinds of animals in close quarters is not high, however, these animals must always be respected in their natural environment. Licensed, insured fishing guide for a maximum two guests. With this new program we strongly believe that we have tailored THE ULTIMATE STEELHEAD TRIP for guests who are looking for the unspoilt nature and abundant wildlife that contributes to an unforgettable fishing experience. Jump on our new wagon that will lead you to some of the world’s most beautiful and pristine Steelhead rivers.